Bruce Lansky's poetry books have sold over 3.4 million copies - just one of the reasons his elementary school admirers have crowned him "The King of Giggle Poetry." 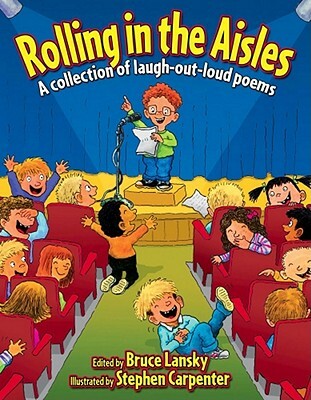 Rolling in the Aisles is one of the funniest anthologies of giggle poetry ever published. It contains humorous poems selected by a panel of more than 1,000 elementary school students. Bruce Lansky, Kenn Nesbitt, Ted Scheu, Robert Pottle, and Eric Ode all made the cut for this giggle-packed collection of rhymes--now available in paperback at just $9.95. Bruce Lansky has created 18 poetry anthologies and 3 silly song book anthologies. Lansky created the popular GigglePoetry.com website for children and the PoetryTeachers.com website for teachers. He also created the Girls to the Rescue series, the New Fangled Fairy Tales series, and the Can You Solve the Mystery series.